I have included some of my paintings here, but do stay and have a look at all of them in My Art Gallery. I am drawn to Native American Indians, especially their faces, but also to their art, culture, history and costume. There are quite a few books, which contain original sepia photographs of N A Chiefs and renowned characters by photographers such as Carl Moon, Ben Wittick, Harriet Smith Pullen, William Henry Jackson and Frank A Rinehart, who was the official photographer of the Trans-Missippi and Internation Exposition in Omaha, Nebraska in 1898, photographing many of the 500 N A Indians, who attended. 'Kills Enemies' (or his sanitised portrait was entitled 'Chief Goes To War') was a Sioux Chief circa 1898. I have drawn his majestic figure from the sepia image contained into the book 'Native American Portraits 1862-1918' - text by Nancy Hathaway, Chronicle Books 1990. I have painted his war apron, war shield of feathers, war hammer and distinctive eagle feathers in his hair in the colours I think would have been used. This painting combines much of the flora and fauna associated with the N A Indian - the snow-topped Rocky Mountains, fir trees, silver birch, blue lakes, waterfalls, rocky shores, bald eagle, brown 'grizzly' bear, salmon and the Great Northern Divers or Common Loons as the Americans call them. The rim of the painting shows typical Sioux designs. Inuits follow the nomadic lifestyle epitomised by the N A Indian, but instead of a hierarchical society their society is egalitarian. They live in the Northern territories of Alaska, but their culture spread from Siberia through the Artic and Sub-Arctic of Canada to Greenland. Here I have included Little Auks, Artic Char, a spotted seal, a polar bear together with an igloo and sled highlighting the specially double-fur insulated, hooded anorak, trousers and moccasin boots worn by Inuits. The method of hunting is through holes in the ice and snow. Traditionally women spend a lot of their time cutting and scraping furs of caribou, seals, polar bears and artic foxes, softening the skins with their teeth, which results in them wearing down dramatically during their lifetime. Each seam of a garment is sewn with sinews to ensure it is water- and windproof to rule out frostbite, which can cripple and prove fatal. The rim of this painting shows Inuit writing. 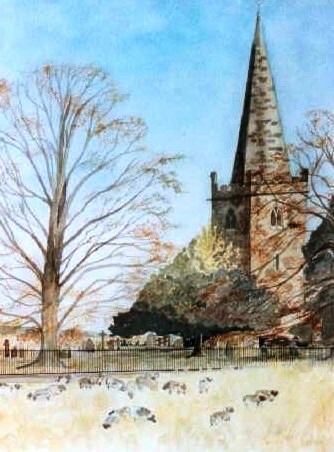 This painting is of a church, which is at Holme Pierrepont, Nottingham, quite near to where I live. I painted the scene from a photograph taken by a dear friend, Ben, who has since died. He told me he got up early one winter's morning and caught sunrise highlighting the warm stone of the church, the graveyard, the yellowed grass and the sheep in the field in the foreground creating a beautiful and uplifting light effect. The view of the spire of this local church at Gedling, Nottingham was painted from the front bedroom window of the last house we lived at. You can see over the houses in front of the church onto the rolling fields behind it. The church clock on the spire is the one featured in the poem 'Weather Vane' below. The day had celebrated matins. cow parsley, puddles and black soil. disappeared along a lupined lane. dashed her beak against brittle barrier. The journey back bumped into clearer skies. 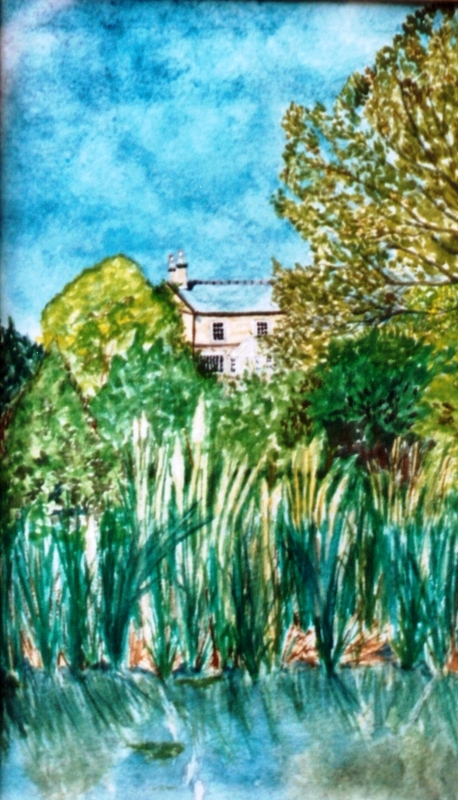 This picture was also painted from a photograph taken by a friend, Keith Taylor - a local writer - of a house hidden by the reeds and bushes edging part of the towpath near Bassingfield, Grantham, Nottinghamshire. I love the dramatic, stormy, blue-grey sky and the merest hint of light at the top right hand corner shining down onto the house and into the water reflecting the vegetation. A moody painting with a promise of clearer skies to come. 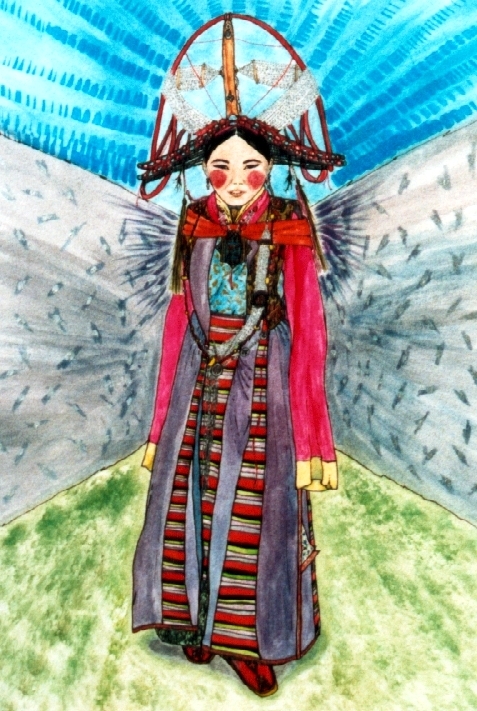 Costume around the world has always fascinated me and Tibet is a place I would love to explore. The festival costume depicted here with its extra-long, phosphorescent pink sleeves, elaborate headdress and braided hairstyle, gold and jewel encrusted bodice, striped skirt and felt embroidered shoes together with a deeply rouged face makes a striking, other-worldly image. I used this painting for the cover of my second book of illustrated poetry entitled *Mandala* and it combines with the poem of the same name. so you will spend days deep in dust. so you will scream to the four winds. so you will twist into the light. witching moons sigh with wishes. 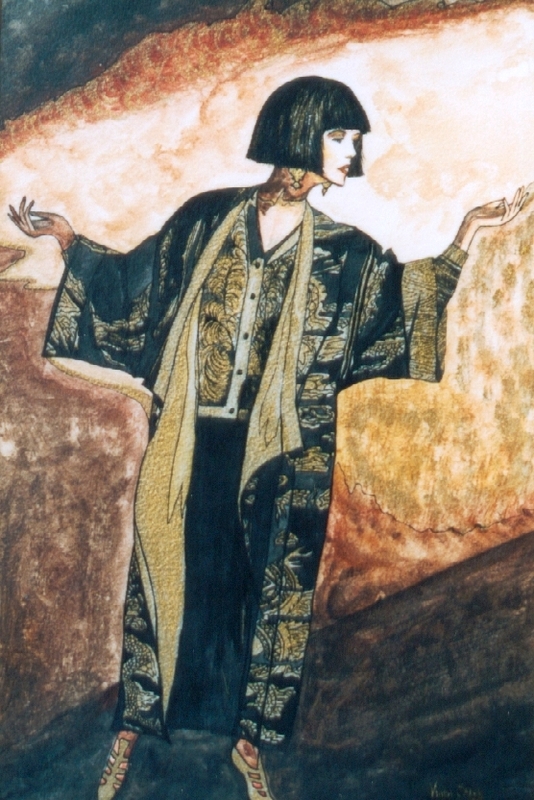 I saw a photograph of this kimono in a magazine many years ago and kept the image to paint. I love the black and gold dragon designs, as they fall in folds. Japanese kimono designs are as many as they are beautiful with the emphasis on floral designs, mythological animals, stylised birds, butterflies, lions and dragons. I love camels and although I have heard that they are very spiteful, bad-tempered animals with a penchant for spitting, I am sure they are much maligned and it must depend on how they are treated. 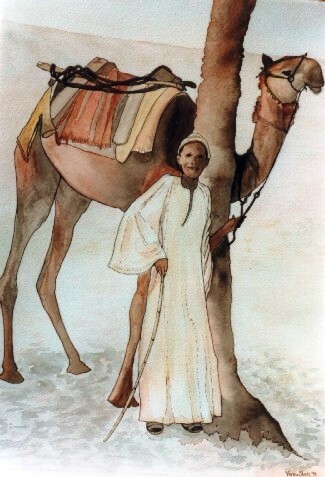 A friend who went to Egypt and rode one said her (very white and fluffy) camel had the sweetest disposition. I would love to have a ride on one and a caravan of camels winding across the sculptured sand dunes of the desert is a majestic sight. 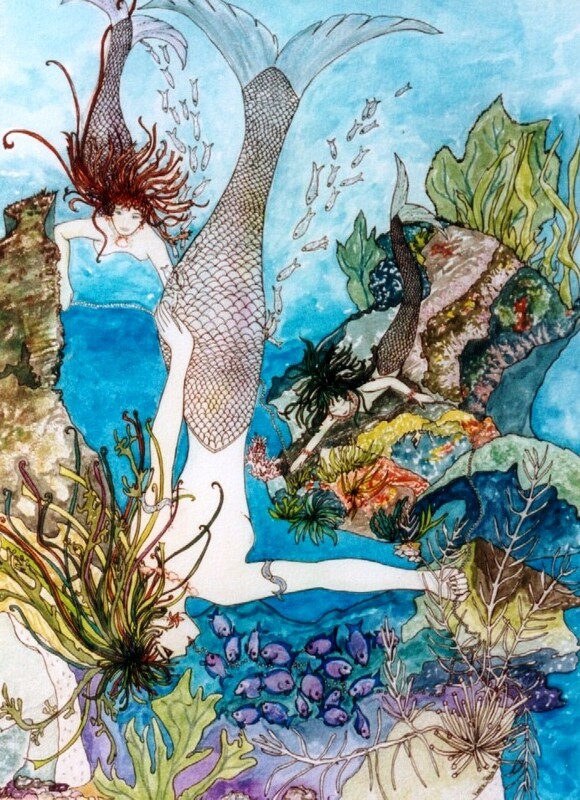 'Mermaids' Pearls' - Myths and legends record sightings of mermaids and I wanted to create my vision of what I think mermaids look like. This painting, (which was published in Poetry Monthly - Sea Towns and Coastal Edition - February 2005), is associated with two poems I have written - 'Half Twin' (published in Rain Dog - No: 5 Spring 2002 and my booklet of illustrated poems - *Promise* 2003) and 'Witch Writer', which was published in Write-Away - Winter 2001 and Magnapoets 2 - July 2008, a verse of which is repeated here, as it formed the basis for creating the picture. catching treasure in the net of her craft ? with the salt-seaweed as her hair."
? 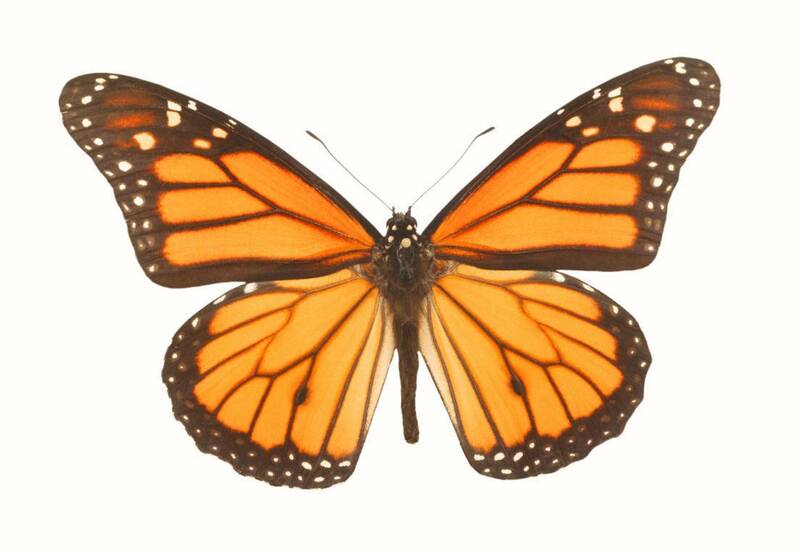 All artwork and poetry on this website is © Vivien Steels.